Park Café availed of the peer-to-peer lending facility and quickly scaled its operations to 10 locations. It has become a popular place for entrepreneurs. Photo courtesy of Park Café. The Mekong Business Initiative, sponsored by the Australian government and the Asian Development Bank, catalyzes lending to promising small and medium enterprises. In 2004, Kuy Vat decided to fill a gap in the Cambodian dining scene. Restaurants in Cambodia were mostly street food or one-room eateries with poor hygiene and no air-conditioning. Local people, especially those from the middle and upper classes, were becoming more aware of the dangers of processed food and artificial flavoring. To address these issues and give diners more choices, Kuy Vat and his partners founded Park Café with the vision of becoming the top kuyteav (a popular breakfast meal) and coffee restaurant chain in Cambodia. Park Café prides itself for serving nutritious, MSG-free food and for giving strict attention to the quality of ingredients. It also strives to ensure that food and beverage meet international health standards. 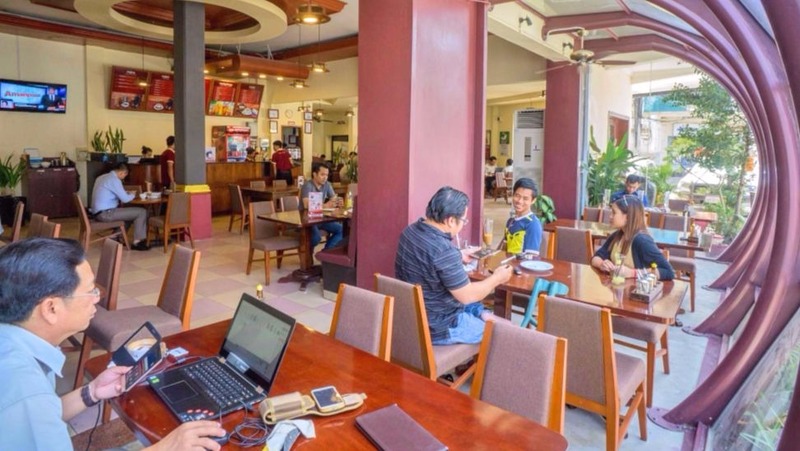 Park Café has become popular with young entrepreneurs, business owners, government officials, and company leaders who want to meet over food and coffee. The atmosphere is professional but relaxed. "Park Café was one of the pioneers in the food and beverage industry in introducing a modern restaurant with high-quality food," explains Kuy Vat. Park Café started small. To scale up and expand the restaurant chain in Cambodia’s capital, Phnom Penh, it engaged with the Cambodia Investors Club (CiC). Lem Chansamrach, managing director of CiC, describes the club as a business community that envisions the growth of the local economy by enabling small- and medium-sized enterprises (SMEs) to access more flexible and affordable sources of financing. Their mission is to mobilize local investors to invest in and lend to local entrepreneurs. Banks lend only to businesses with accounting records and collateral, such as real estate. SMEs rarely have these resources to secure their working capital. As a result, they often resort to borrowing from informal moneylenders at a high cost. Enter the Mekong Business Initiative (MBI), which is supported by the Australian government and the Asian Development Bank. They identified CiC as a potential private-sector partner for a development-led effort to broaden access to finance for Cambodian entrepreneurs. MBI organized a tour for CiC in the People’s Republic of China (PRC), Singapore, and Thailand to learn more about peer-to-peer lending and to identify best practices applicable to Cambodia. Peer-to-peer lending, or P2P, is the practice of lending money to individuals or businesses through online services that match lenders with borrowers. "The trips to the PRC, Singapore, and Thailand enabled us to learn about the latest innovations in fintech that could help SMEs access more affordable and flexible financing, and could be introduced and implemented within the existing legal framework," said Khemara Ros, access to finance manager at MBI. These three countries have different lending platforms, providing a varied base for analysis. CiC learned that informal or high-cost financing systems only stunt the growth of the private sector. Also, formal regulations, clear guidelines, and open communications can prevent fraud and ensure trust between parties. CiC explored a peer-to-peer lending platform that allowed their members to lend and borrow money on a monthly basis without the involvement of traditional banks. The platform allowed members with excess cash flow to lend and earn interest. Meanwhile, those in need of finance have quick access to funds. It also allowed greater involvement among SMEs and the lenders, leading to a more transparent lending environment. Peer-to-peer lending will not replace traditional bank loans, said Chansamrach, but it can be a key solution to facilitating access to finance for many SMEs. Park Café availed of the peer-to-peer lending facility and quickly scaled its operations to 10 locations. "A quick, alternative source of funding for working capital from CiC was a key part of our growth,” says Kuy Vat. “CiC has also helped Park Café to grow in three other aspects: sales, marketing, and business development." CiC and Park Café have since developed a robust relationship. Members of CiC are the first to know what's happening at Park Café. They are invited to events, and in turn help promote the café through word of mouth. CiC often holds trainings at Park Café on different aspects of business, including accounting, tax matters, finance, sales, marketing, and customer service. Café employees are invited to attend and advance their professional development. Park Café serves close to 2,000 customers a day across its 10 outlets. It has set its sights on the next stage of expansion, which includes opening outlets in Siem Reap, Kampong Cham, and Kampong Som (also known as Sihanoukville). CiC continues to facilitate financing for hundreds of SMEs across Cambodia, providing millions of dollars of investment. The Asian Development Bank and the Government of Australia launched the Mekong Business Initiative in 2015. The MBI catalyzes private sector development in emerging ASEAN markets, focusing on Cambodia, Lao People’s Democratic Republic, Myanmar, and Viet Nam. The program helps improve the business-enabling environment in these markets with particular focus on business advocacy, alternative finance, and innovation.